We offer Pipe Conveyors from Premium Engineers. - (Screw Type) For handling of bulk materials. Medium Duty, Dust proof & Compact Design. - Ideal for Dusty, pungent materials like Spices. standard models & custom built. 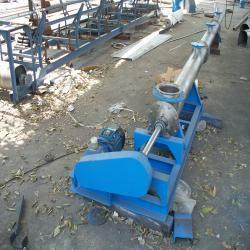 - Pipe Conveyor - Pipe Conveyors - Pipe Conveyors Manufacturer - Pipe Conveyors exporter - Pipe Conveyors Supplier. A break through in Belt Conveyor Technology overcoming the limitations of conventional conveyors. It has all the advantage over a typical conventional Belt Conveyor while adding further characteristics of having Horizontal and Vertical curves. It can also have steep angles without any transfer points. It can convey dust as well as bigger lump sizes. And is particularly recommended in Cement Industries, Power, Fertilizer, Steel And Glass Plants etc..
MEFA designs and manufactures different type of custom built conveyors for innumerable material handling applications with economical budget ranges. 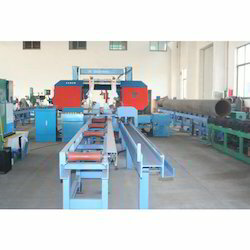 Pipe Conveyors are used for conveying pipes (Spirally Welded / ERW / Seamless) in unidirectional or bidirectional way. Hydraulic lifting blades assist the transverse movements from one line to another. COBIT has successfully commissioned Pipe Belt Conveyor system. The belt is a conventional trough shape at the feed end and is rolled by six special rollers into the circular section. At the discharge end, the pipe belt conveyor is opened up by a special idler arrangement and the material is discharged. We have gained recognition as an eminent enterprise, devotedly engaged in manufacturing a broad range of Pipe Screw Conveyor.